Covey/Hobbs Vs GTD – a War not Worth Waging. ≈ Comments Off on Covey/Hobbs Vs GTD – a War not Worth Waging. GTD is a list-based system. (Now it gets complicated.) The idea is to collect all your unfinished business, including ‘projects’ which Allen defines as anything that requires more than one step to complete. Having done that, you go through the list and complete all 2-minute jobs. Then you are left with a list of things which you can (usually) only do in a certain place, at a certain time, with a certain person, etc. For example, some of the things may be tasks you can only do ‘At Computer’ so they would then be listed on a list entitled ‘At Computer’. Or ‘At Shops’ for shopping, or ‘In London’, and so on. 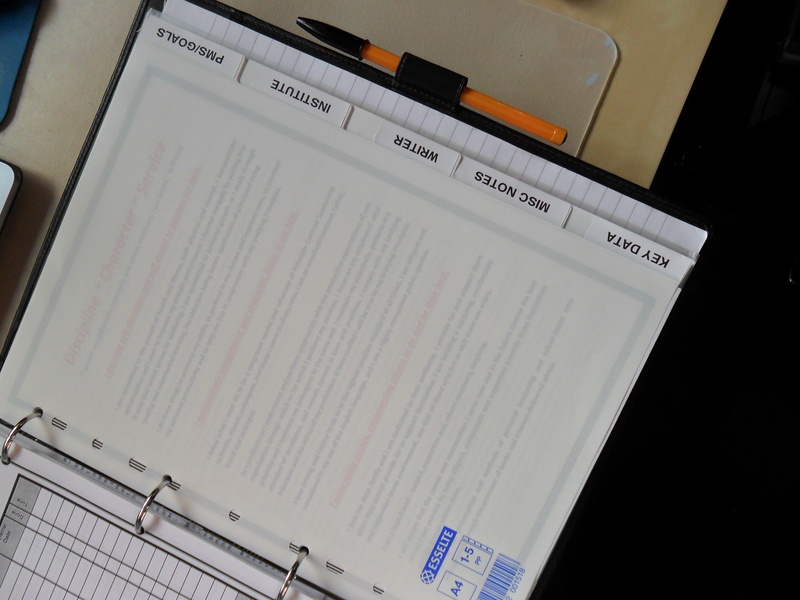 Time- and day-specific tasks – and ONLY those – go on a calendar (diary page). The lists should have on them only ‘next actions’, the things you have to do next to get the projects done. That really is an idiot’s guide, and Allen’s system has a lot of thought/psychology and method behind it which this little blog can’t cover. Zealots in either case would argue for their preferred option. GTD-philes would argue that lists equate to freedom while Covey/Hobbs is restrictive. Covey/Hobbs would argue their way supports a sense of meaning and peace, while GTD is ‘just’ about productivity, and productivity is not as important as meaning. Deeper analysis would identify further objections to the opposing philosophy, and more supporting evidence for the preferred way. Who has time? I have a different outlook. I think the GTD Way of collecting all your incompletes, doing the resulting 2-minute jobs and planning the others is an excellent way to get control, while the Covey/Hobbs method is an excellent way of keeping control once you have got it. People have asked me how I manage so many responsibilities (job, home, family, IAM, IPI, Cardiff Speakers Club,) and my answer is that I can do this because of my mastery of the Covey/Hobbs method, but if I was to take on those responsibilities all at once I would start with GTD until I got things compartmentalised. then making lists of the things that need to be done but which have no appointed time. Both require knowing the end result in advance and deciding what to do about it next. Overthinking it may identify one as requiring ‘task-to-objective’ thinking while the other would be seen as having an ‘objective-to-task’ perspective but in all practicality, they end up being the same process, which is asking “What I gotta do to get what I wanna get?” and then planning to do that action, somewhere. And that, lorries and gelatines, is the only difference. Which is hardly a difference over which one should declare war. As always, my advice would be to master your preferred method and leave the other well alone, because there is a tendency to try and do both at the same time and when you do that your head gets cluttered – which defeats the objective of either style. Pick one. Master it. And reap the rewards. Oh, and unlike all those GTD examples of people who get an e-mail a minute (and I have never, ever met one), I get about 10 a day. Makes life a tad easier. As the weeks have passed on my efforts to be more compliant with the Three Resolutions I have become more and more convinced of the power of the PMS, and therefore the importance of the PMS. What these nice, pleasant, successful and productive people have is an unwritten PMS and/or set of unwritten value statements. They know what they want and how they’re going to get it in a principled fashion, and they set about doing that. Good on them, and may that continue. Some of us, though, like the idea of having these things written down as (a) a reminder of what we are doing, why and how we will do it and (b) as a public declaration of those things so that we can be held to account when we wander off course. In the context of (a) we recognise that there will be occasions when, through fatigue, overwhelm, stress or even danger we might not quite act in accordance with our values and we want to remind ourselves that those are the very times when we MUST so act. In the case of (b) we recognise that sometimes we are not strong enough in ourselves to act in accordance with our PMS and it would be nice if, just IF, our friends, family, colleagues and others would support us in getting us back on track instead of either pulling us off track or taking the mick because we have ‘failed’. But even the simple act of putting my PMS on my laptop as the main screen wallpaper has caused me to execute in its regard. I’ll be surfing away or working on something routine when I see the PMS glaring at me, and despite my fatigue and (slowly wavering!) dislike for running I will change and go out there and do what I have declared I will do, because it addresses all Three Resolutions – Discipline (Resolution1), Character (Resolution 2) and Service (I’m preparing for a sponsored event and to support a team effort). The same applied to the hours I’ve put in the last two weeks on the Professional Investigator’s Manual and a colleague’s PowerPoint presentation – it’s about the Mission, and the Mission serves me and makes me better, while also serving others. Eventually the PMS will be emotionally tattooed on my sub-conscious but for now, and even after that happens, the words I wrote – no-one wrote them for me, they are my words, my intent and my focus – will remain where I place them. In public, both pictorially and (I intend) visually in what I do and how I do it. Now go and write yours. Then live it! I just told you! Go and write yours. You have 7 days, and I’d love to see them in the Comments section when you’ve finished. If you’re stuck, try http://www.franklincovey.com/msb . Hit the wall on a run this week but ran through it. I say run, more of a struggle. My weight loss was only half a pound but the (ahem) waste disposal system is a bit slow and I expect next week’s results will compensate. I mean the weight, not the other thing. I am but 5lbs behind schedule, now. But I was so productive and positive it hurt, so the concepts of Discipline-Character-Competence really are working for me. I’m also developing next year’s A4 (letter sized) personal planning system, creating DIY forms and all the paper I’ll need to manage myself for the 12 months after my current Daytimer expires. 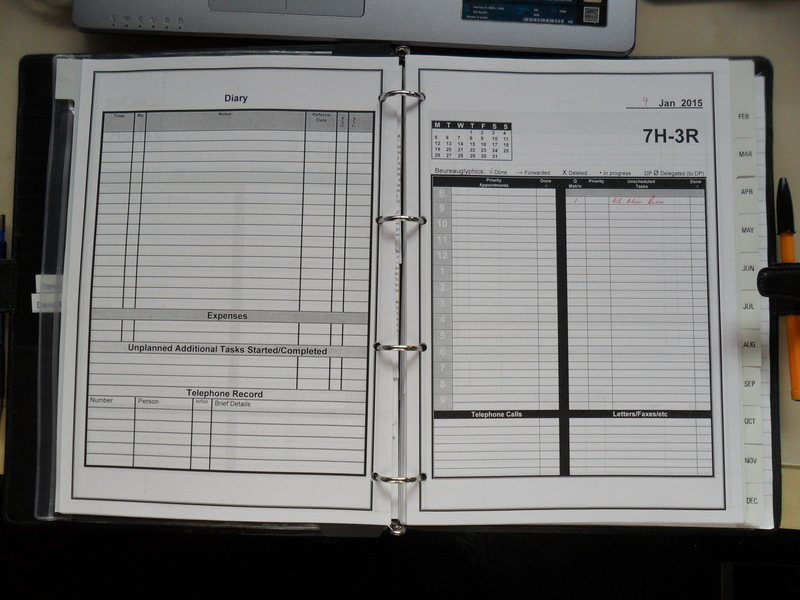 (Dear FranklinCovey/Daytimer/Filofax – you need to go A4, 2 pages to a day with a 4 ring binder for us Brits.) I’ve prepared my planning diaries up to 2017 so I’ll not be buying an industry-designed planner until at least then. Unless their pretty catalogues start tempting me as they tend to do whenever they plop on the hallway mat……. My 2015 Planning System, courtesy of do-it-yourself forms, a Dymo printer and a Filofax leather binder that cost £2 in a charity shop. You’ll note my PMS behind the plastic divider…..